New Choclate Shakeology is Now Customer Approved –Try Here! New Chocolate Shakeology is Now Customer Approved –Try Here! 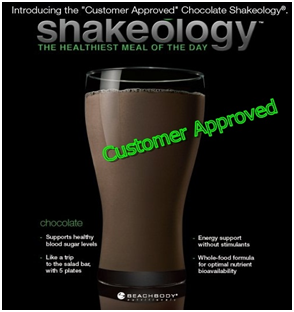 Chocolate Shakeology comes in the new customer Approved formula that is here to stay! The Customer Approved formula of the brand new Shakeology will be out in the stores and the shipment will start this week. Get a Hold on your pack of the improved chocolate Shakeology that is as healthy as the previous one. You just have to wait until Friday to place the order. Feel Energized, Reduce Cravings, Lose Weight, Improve Digestion, and Now It Tastes Great Too! Although the previous tag of Super food logo has been removed from it, but the Customer Approved formula is no less healthy than before. With the improvement of the protein blend , the texture is improved, so that you do not have to worry about the aftertaste! The best part is that none of the 4 new Super foods are sacrificed in the making of Customer Approved Chocolate Shakeology, so now when you buy New Shakeology, you do not skip on the nutrition of the shake. Get Customer Approved Shakeology on Home Direct! If you are on the Shakeology HD program, you will be automatically switched to the new Customer Approved Super food formula with your next shipment. So do not worry about calling a bunch of people to get the new Chocolate Shakeology. Just buy new formula Shakeology on HD and get the auto shipment right at your doorstep. If you love the current Superfood Shakeology formula, then you need to start ordering the Chocolate Flavor before Friday and fill up the inventory this week (before the Customer Approved Shakeology hits the stores). Now you can say with confidence that Shakeology is indeed the Healthiest Meal of the Day that tastes great too!